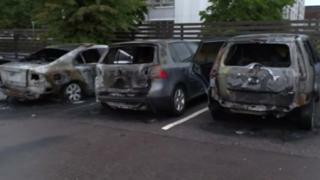 Dozens of cars have been set alight in Sweden overnight, in what police say may be a co-ordinated criminal action. Up to 80 vehicles were badly damaged by gangs of black-clad youths, beginning at about 21:00 local time (19:00 GMT). Most of the damage took place in the western city of Gothenburg, but incidents were also reported in cities up to 100km (60 miles) away. Cars were also damaged in Trollhattan to the north of Gothenburg, and Falkenberg to the south. As far away as Stockholm, a handful of cars were also reported on fire – but the link between those and the widespread arson in western Sweden is not clear. The masked young people broke car windows before pouring flammable liquids inside, Swedish media said. They were also seen throwing stones at police officers. Despite the damage to property, there have been no reports of any injuries. Police said they had identified some young people who were in the area at the time and spoken to their parents – but officers could not say which, if any, were involved in the fires. There is no clear motive for the widespread destruction, but the arson echoes the damage done during riots in Stockholm over several nights in May 2013. They followed the death of an elderly man who threatened police – vehicles were set alight in poor immigrant neighbourhoods, also by masked youths. The 2013 riots sparked a debate about immigration in some circles, and unemployment and the widening gap between rich and poor in others. Sweden is firmly in election season ahead of September’s polls, and immigration remains a key issue. Mr Lofven’s government party, the Social Democrats, is facing the worst poll numbers in its history, to the benefit of anti-immigration party the Sweden Democrats.